The shores of the video games industry were lush and fertile when The Settlers first came upon them in the early 90s. And even though the land has become a bit of an industrialized wasteland since then, The Settlers have once again returned. 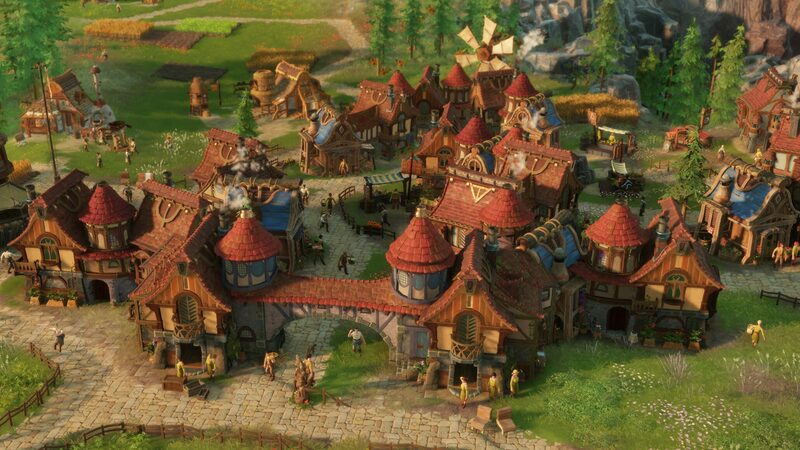 As announced at this year’s Gamescom, The Settlers are coming back, courtesy of historic developer Ubisoft Blue Byte. The iconic and foundational game paved the ways for the city sim genre, with players building early outposts expanding in empires. The new game promises similar innovations in the genre with frankly hasn’t improved much since the original came out. But first, we have to discuss the look of the game. In the hands-off presentation I witnessed, the sheer scale of the world was astounding. Citizens skip merrily down roads and greet each other warmly as they pass. Carriers haul heavy loads from place to place while workers use rudimentary machinery to refine your resources. The game is colorful, sure, but the very of color in the action of your city feels more important. This is one of the few games I’ve witnessed where the city actually bustles. And with The Settlers, there is no hard population cap for the player, ever. In a first for the series, and for the genre as a whole really, houses are not used to increase the population cap. This means even from the beginning of the game you can have dozens of individual citizens building you fledging metropolis. And having seen footage from a game save several hours in the making, cities can have thousands of citizens running around and performing their duty at once, all powered by the Snowdrop engine. Houses are still used though, and will still line most streets and corners of your ever-expanding empire, but this time they are used entirely for cooking meals. It might seem a little indulgent to build an entire house just for the kitchen, yet the result has an interesting effect on gameplay. Now your workers will get tired, and need a meal to restore themselves. Tired workers slow down production and that can rapidly de-escalate your expansion efforts. Houses will produce food gathered by the works and create meals, meaning you still need several houses to keep your population under control, but not simply to have it. During the presentation, this mechanic seemed to be executed perfectly and fits much better with today’s technological prowess. The presentation also showed us a population not under control. While the means of warfare have been revamped for the new title, it’s nothing too surprising. Armies fight one another, raze buildings and seize keeps; this allows you to control the land. But there are other ways of spreading into enemy territory. Although it might not be as quick, players can now win with what was described as an honorable victory, by challenging rival cities to a one versus one battle in the arena. These battles are fought with the cities’ best champions and, as tradition dictates, they’re spectated by huge crowds from both towns. The losers though, will return home disheartened by the defeat and may well take up torches and pitchforks against their rulers. Ringleaders might even seize a keep for you and pledge loyalty to your city, providing you with the land, buildings, and the workers. There’s still a lot of time before the release of The Settlers and a lot left for the developers to address. Right now the arena battle I saw was gameplay footage of how they imagine the fights will look, but this isn’t confirmed yet. But regardless of that, clearly the developers are looking to revitalize the genre, and expand on their original concept in ways you might not expect. The game is scheduled to launch in Fall 2019 and it will include online multiplayer skirmishes. Meanwhile, this Fall Ubisoft is launching The Settlers History Collection including all of the previous titles, optimized and improved for the occasion.